I wonder whether you can imagine what it was like to be the man at the pool in John 5:1-18. The story goes that the first person into the water when the water bubbled up would be healed. 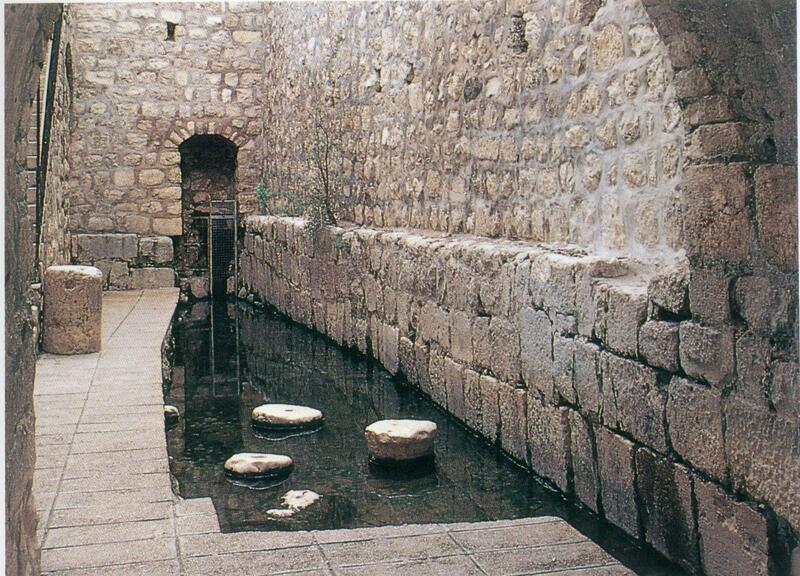 What might it have felt like to have been lying by the pool of Bethzatha for 38 years? Waiting for that chance to get to the water first, but always being too slow to get to the water before someone else. What might it have felt like, in that hot climate, to occasionally put your toe, in the clear cool water of that sheltered pool? What might it have felt like, after talking with Jesus to be able to walk again? Just imagine what it was like for that man to have his life changed by Jesus, so much so, that after many years of being disabled he could walk again? It is good to use our imagination, …. whether it is to feel the coolness of the water, or to imagine the long years of hopeful but frustrating waiting of the man by the pool. Or to imagine the way life can be utterly changed by just one encounter with a special person. Our churches in Ashton usually have baptism service on the first Sunday of the month. 5 children were baptised in our services today. Everyone present at those services was participating in the service, not just those who led intercessions or lessons, not just the priest, the parents and the godparents, everyone was a participant not a spectator. The young ones being baptised are very unlikely to remember the experience, but everyone else present will remember the services they participated in and in remembering this service, they will have the opportunity to imagine what it was like when they, themselves, were baptised. If we were baptised as infants, a service of baptism is an opportunity to imagine … to imagine just what happened to us at our own baptism. Wonderful promises were once made over us, just as they were over the young ones today. God promised us that he would be there for us, God surrounded us with his love and with the love of our families, friends and the worshipping congregation of the church in which we were baptised. Wherever we are in our lives right now, we can continue to be like the man at the pool who was always waiting for something good to happen to him, or we can turn to the one who can change our lives for ever – the Lord Jesus Christ. Just as Jesus changed that man’s life for ever, so can he change ours. Baptism is the promise of that, the deposit, the security. Each of us who have been baptised only need to turn to God for support and help and he will be there for us. God does not make us a promise that everything in our lives will be brilliant, not even just OK. But God does promise that he will be there for us, alongside us in all the experiences of life bringing encouragement and strength. As the children we bring for baptism hear God’s words of love, telling them that they are special and secure in that love, we have the chance to remind ourselves that we too heard just those same promises made over us and to realise that God continues to reach out in love to each one of us. What might it be like to have a friend, who is always there for us, through thick and thin, through whatever life throws at us. A friend who will never let us go? This is just what Christians believe about Jesus, this is what God promises in baptism. Today we can choose to take him up on the promises we received at our own baptism. Just think, just imagine what that could be like! This entry was posted in Ashton-under-Lyne Blog, Comment on May 1, 2016 by rogerfarnworth.